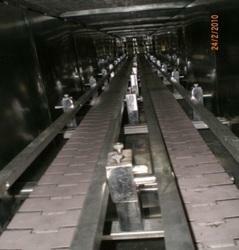 We are engaged in offering Chain Conveyors that are extensively used for transferring heavy loads. Chain Conveyors also permit one to change direction of the Conveyor as per the specific requirements. 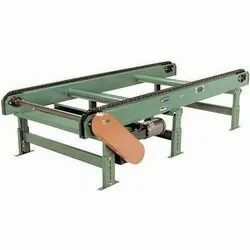 Chain Conveyors are manufactured by us and to manufacture these products we are associated with the trusted vendors so that we supply the high quality of products to our customers. These products are known for their smooth operations and they can easily carry the heavy material from one place to another in horizontal manner. Shree Shot Equipment Pvt. Ltd.
We are offering Wire Mesh Chain Conveyor to our clients.